In my last article I recommended three different 135mm lenses based on their price (less than 100 significant units, whether they be dollars, pounds or euros), image quality and build. These were all M42 lenses that will require an adapter to use on your digital SLR. I have an official Pentax brand M42 to K-mount adapter to fit the Pentacon 2.8/135mm preset (made in DDR) to my K20D. Here I'll share some results and initial impressions. 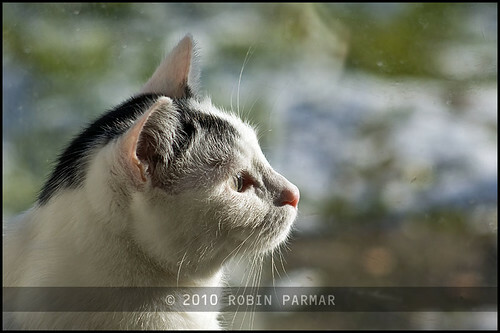 These two photos of Schweppes I took earlier today as she sat staring out into our snowy back garden. Those who follow me on Flickr will know that she is my favourite subject! I have processed these shots minimally, bringing them through my automatic settings in Adobe RAW Converter and then just touching up the contrast a bit. Actually I cannot guarantee the colour balance hasn't shifted as well, since these are not rigorous tests (I don't do those often) but rather real-world use cases. I would likely have done a bit more post-processing but I wanted to keep them close enough to the original RAW file so that the image quality of the lens could be judged. So it's a compromise. The colour is the first thing to notice. It is distinctly "old world", with a yellow-ish tinge and muted hues. I am used to the modern Pentax colour rendering, which is vibrant and true to life... maybe a tad punchier than real. I almost never need to enhance -- and am just as likely to tone down -- the colours. The Pentacon is not up to those standards but has a look that I find appealing -- at least for this subject! In the following shot the colours have been hyped a bit so it is not a fair comparison, but I would say from recalling the RAW that it started out much the same. As far as sharpness goes, I've been needing to adjust myself to the fact that it is difficult getting perfect focus, since the focus ring is stiff. Likely it needs a good service. As it is I don't mind the friction except if I turn it one way the lens starts to unscrew from the mount! This is terribly annoying as it means I need two hands. So fine focus is not easy to get. 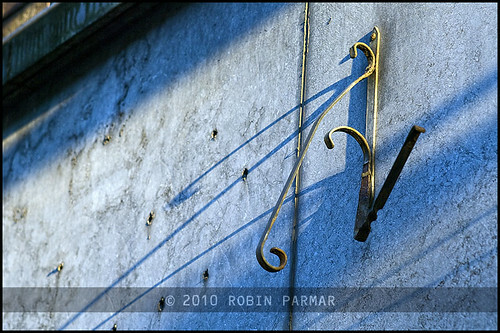 A remark in passing: for "Shadowy '2'" above I did some extra sharpening and detail enhancement in PP. All the other shots have only a bit of final sharpening after size reduction. You should likely look at them in their native size on Flickr, as these have been resized further for the blog. I have not posted full-size images and see no real reason to do so. I don't generally gaze at 100% pixel photos and I hope neither do you! Even considering those objects that lie in the focal plane, the lens is not up to the standards of the FA 43 Limited or FA 77 Limited, both of which I am very familiar with. But let's be reasonable, it costs a fraction of their price! And it's a few decades older. I should note here that these sample photos were taken at varying apertures between f/2.8 and f/8. Basically I kept the preset stop at f/8 and simply shot what seemed best. The EXIF cannot note the aperture used on a manual lens and I didn't stop to take notes. 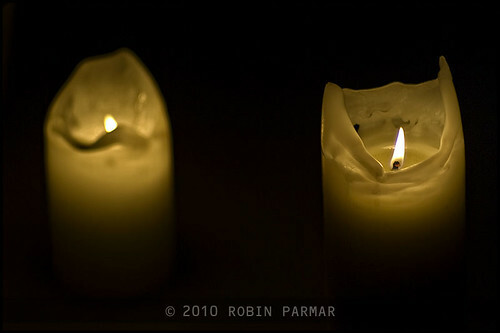 The candle shot was hand-held in a dark place. I had to crank the ISO, so I have run it through some modest noise reduction (using Noise Ninja). It is sharp enough though, don't you think? This photo starts to show the nice out-of-focus rendering the Pentacon is known for. I don't have any super-amazing bokeh examples but wait until spring when the flowers are out! Actually, while the rendering of blurred elements is very smooth, I somehow doubt the Pentacon does this any nicer than a similar focal length lens at a similar aperture. The multitude of aperture blades does not guarantee nice bokeh; it simply means that out of focus specular highlights will be circular in shape. And actually I quite like hexagonal highlights (call me weird) so this is not a big issue for me. But I am sure further shots will reveal all! As far as handling goes, I love the stepless aperture and preset system. The lens does not feel too heavy to me, but I wouldn't want one more massive. And it's not too long considering the hood is included. Unlike the Carl Zeiss Jena, the length does not change much when you focus. However, I have been completely spoiled by the FA 77mm Limited which is a tiny thing. This makes me wish for a compact FA 135mm Limited, which will never happen I am sure! My second big issue with the lens (after the focus ring) is the minimum focus distance of 1.5m, which is insanely long. In practical terms I am always too close to what I want to shoot. More so, I cannot shoot anything on the ground except at an oblique angle. 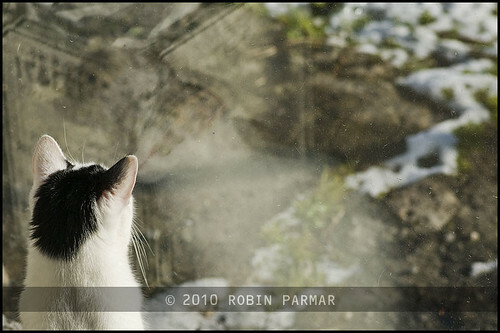 (On Flickr I have a footprint in the snow as an example.) This annoys me. In the previous article I remarked on the fact that the body contacts are exposed. if someone has a solution for this, please comment. I do not feel that good out in the snow with the camera half naked! If you want to see my shots with this lens as they progress, click through one of the images here to get to Flickr. Then note the dedicated set I have created for the Pentacon. If this series of articles is useful to you, please consider donating to our heating fund, using the PayPal link in the sidebar. I guarantee that all money raised will go to our natural gas supplier!